Want to streamline your DevOps toolchain for a new project on the cloud? Want to manage, store, share, and version binary artifacts? It’s time to explore the composite solution offered by AWS CodeStar and JFrog Artifactory. When deciding to kick off a new project, technology companies and enterprise solution providers often run into walls when setting up their DevOps components. A plethora of tools, each one with it’s complex configuration to integrate into a synergistic pipeline slows down progress and increases costs. Let’s look at a CI/CD implementation through AWS CodeStar and several challenges one can face at the time of implementing a DevOps toolchain. AWS CodeStar allows teams to quickly develop, build, and deploy applications and microservices on AWS. However, the absence of a universal binary repository creates a challenge. In such an implementation, a single project connects to multiple binary repositories and storage sources such as Docker Hub, ECR, Maven Central, npmjs, RubyGems, S3, and others. The dependencies of this single and simple project are pulled from multiple sources such as ECR, S3, Maven Central, and npmjs (for npm). Figure 1 illustrates the workflow of the solution. In general, with multiple binary providers, the most painful problem is to make sure that the correct version of a binary of any type is being used. For example, tested or scanned binaries versus snapshot or vulnerable versions of binaries. Imagine a scenario with multiple CodeStar projects and cross-project dependencies. 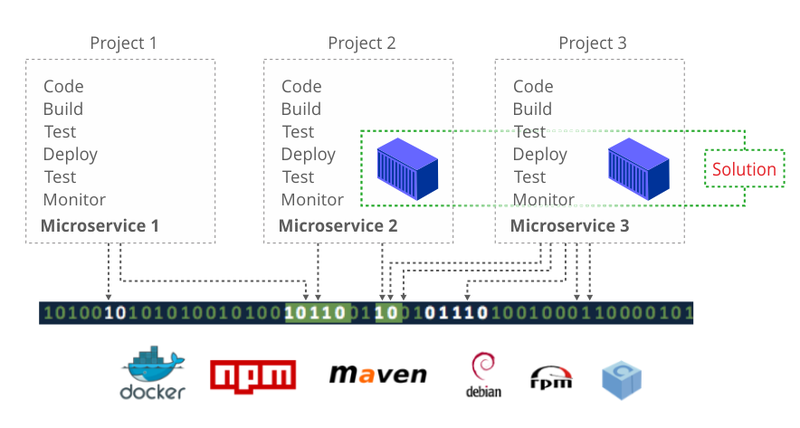 In the world of microservices, the challenge is magnified because we have multiple micro-focused applications working towards resolving a bigger challenge. The solution involves several AWS CodeStar projects (i.e. one per microservice) and cross-project dependencies. Figure 2 illustrates a working solution comprised of several CodeStar projects and dependencies. Cross-project dependencies can arise because of a team structure, architecture or the way a CI/CD pipeline is implemented. For example, Project 1, from Figure 2, is responsible to build a web application and Project 2 (owned by the DevOps team) is responsible to containerize it and eventually deploy the solution to production. In this case, managing cross-project binaries of multiple types coming from multiple repositories adds to the overall complexity. The lack of a single source of truth or a universal binary repository makes the implementation of policy enforcement difficult. The solution to resolve these challenges is to use a universal binary repository that will act as a single source of truth for all your binaries. It’s the most pragmatic approach to managing multiple binaries of different types and their associated metadata in a single place. And, that’s where JFrog Artifactory comes into the solution! 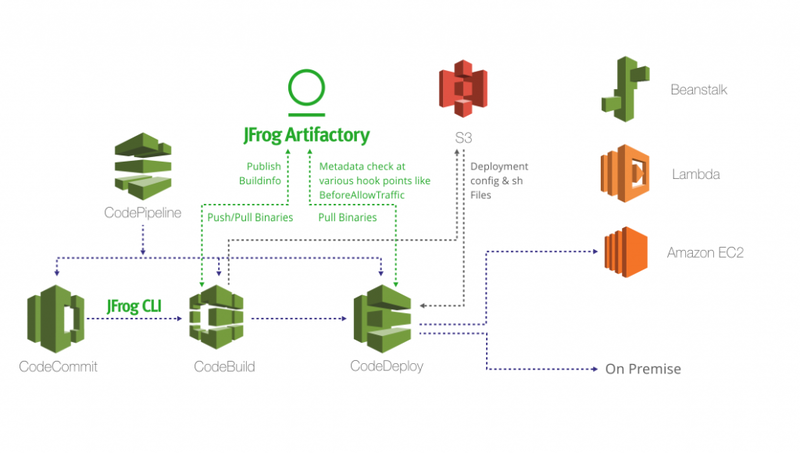 The good news is that AWS CodeStar integrates with JFrog Artifactory. The integration allows Artifactory to act as a single source of truth for all types of binaries across multiple AWS services such as CodeBuild and CodeDeploy. To make it more interesting, the same Artifactory instance also acts as a single source of truth for cross-project (AWS CodeStar projects) dependencies and offers additional benefits such as exhaustive build information(BuildInfo), promotion, traceability, and universal support for all major development technologies. Figure 3 illustrates a composite solution of AWS CodeStar and JFrog Artifactory. The following steps drive you through the integration process of Artifactory with CodeStar. For detailed information about building and deploying applications on AWS by using CodeStar and Artifactory, go to the AWS CodeStar home page. In addition, get a free trial license of Artifactory, if needed. To help you along, we’ve created this a GitHub project that includes scripts and configuration files to build and deploy a containerized Java web application, which is similar to the example used in this blog post. Start by creating two Java projects in AWS CodeStar (AWS CodeStar -> Create a new project). Select “Web application” under “Application category”, select “Java” under the “Programming languages section” and select “Amazon EC2” under “AWS services”. As an example, let’s name these two projects “demo-java-app” and “demo-docker-framework”. Project files including build and deployment files will be created by default that can be viewed via AWS CodeCommit. Create a SecureString parameter in ParameterStore to store Artifactory credentials. It is recommended not to use environment variables to store credentials. a. Specify the newly created SecureString ARTIFACTORY_CREDENTIALS as part of the buildspec.yml. You can learn more about controlling access to Systems Manager parameters in the Amazon EC2 Systems Manager User Guide. ARTIFACTORY_USER Artifactory user name with read/write permissions. a. Download the necessary packages including JFrog CLI. b. Configure Maven settings.xml to point to Artifactory. The complete file can in JFrog’s AWS CodeStar example on GitHub. 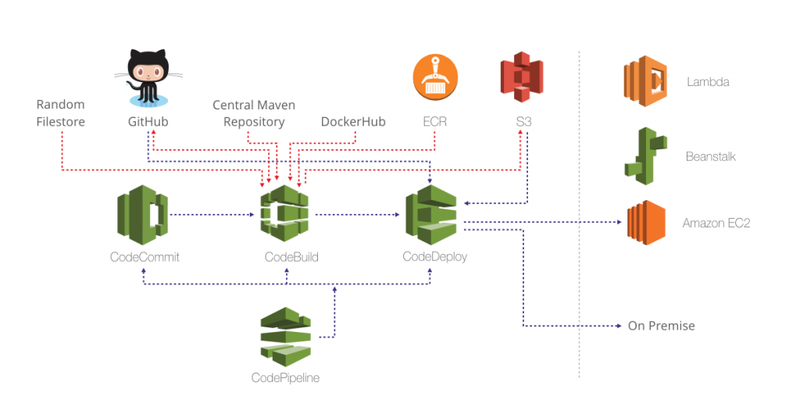 c. Build the Maven project. d. Publish binaries and build information to Artifactory. Executing the above steps creates and publishes a Java web application along with metadata. The next step is to containerize the web application using the “demo-docker-framework” project. 1. Install Docker on the EC2 instance of the “demo-docker-framework” project. The EC2 instance used for the project can be located under the “Project Resources” section (AWS CodeStar->$PROJECT->Project). 2. Create or use the existing SecureString parameter (ParameterStore resource) to store Artifactory credentials. Make sure to update the role policy that is part of the CodeBuild service role of the “demo-docker-framework” project to allow access of the ParameterStore resources. Select the Privileged flag. This step allows the creation of docker images. ARTIFACTORY_USER Artifactory user name. This user should have read/write permissions. IMAGE_TAG Dynamic version that will be one of the tags of the docker image created as part of the build. Example: latest, latest1, etc. Note, in addition to a dynamic tag, there will be a static tag that reflects the CodeBuild ID. 4. The updated buildspec.yml file configures dind to build docker images, installs required packages, leverages access tokens to authenticate with Artifactory, builds docker image and publishes the docker image along with the build information (metadata) to Artifactory and updates deployment scripts. b. Create an Access Token in Artifactory. It is recommended to use an Access Token since it expires after a configurable time and can also be revoked. By default, a ‘readers’ group exists. It is recommended to create and use a new group, ‘writers’, so that access tokens can be used for RW operations. More information about groups is located in the JFrog Artifactory User Guide. Except credentials, all other parameters such as the Docker registry name, URL, etc are fetched via environment variables. Details are located on our Docker framework example on GitHub. - docker build -t $ARTIFACTORY_DOCKER_REPO/my-app-image:$IMAGE_TAG --no-cache --build-arg WEB_APPLICATION_NAME=$WEB_APPLICATION_NAME . As you can see, AWS CodeStar allows teams to quickly develop, build, and deploy applications and microservices on AWS; and with the integration of JFrog Artifactory you now have the ability to manage these processes with a single source of truth for your builds. Go cloud-native with AWS CodeStar and JFrog Artifactory as your single source of truth.